If you're looking for a festive project and a unique gift idea, consider making Christmas votive candles this year! Giving a candle a Christmas or festive fragrance is a great way to introduce some holiday spirit! The gentle scent of a votive candle will float around the home, helping to create a special atmosphere. There are many fragrances that help to conjure up an image of Christmas. These range from natural essential oils to synthetically produced fragrance oils. When buying fragrances for candles, it is important to check with the supplier to ensure that the fragrance oil is suitable for use with candles. Some fragrance oils are flammable at low temperatures or their fragrance may alter when heated. Christmas fragrances include orange and cinnamon, frankincense, mulled wine, and pine. 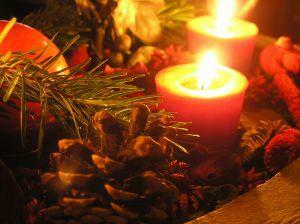 Another important way of giving a candle a theme is to create a candle with Christmas colors. The traditional colors of Christmas are red and green. Many people feel that these are 'the' colors of Christmas and as such are essential for making Christmas votive candles. There are many other colors, however, that are popular during the festive season with purples and deep burgundy reds being increasingly popular. Metallic golds and silvers are very festive and look lovely when combined with other colors. Creating your own colored votive candles is a great opportunity to match the candles to an overall color scheme. A few decorations can be added to handmade candles to create a Christmastime feel. This is also a wonderful way of dressing votive candles up for gifts. A beautiful piece of ribbon tied into a bow or a couple of sprigs of holly can give even the most plain votive candle a festive makeover. Some candle makers decorate their votive candles with glass beads. Glass beads have a lovely shine and are available in many different colors, making them a versatile choice for adding a touch of sparkle to a handmade candle. Many candle supply stores sell a range of special supplies that have been designed for the Christmas holidays. Taking a look at their catalogs, brochures or websites is a good way to find unusual Christmas supplies as well as great inspiration. Some candle making classes also specialize in making seasonal and festive candles. An alternative to making Christmas votive candles is to place handmade plain votive candles into festive candle holders. This is a good way of using plain candles while not losing the festive feel. There are many different types of festive candle holders, including ready made votive candle holders that are created with a special Christmas design as well as handmade candle holders. Plain candle holders are readily available from candle making supply stores and these are easy to decorate with glass paints. This is a quick and simple way to add a festive touch to a plain glass votive candle holder. For more tips on decorating your home for the holidays, visit LoveToKnow Christmas.